You can edit DOCX documents for better use when learning foreign languages. Les cartes les plus efficaces pour l'apprentissage des langues étrangères. Vous pouvez modifier et imprimer des cartes pour un usage personnel et l'apprentissage des étudiants. Cartes spéciales pour l'apprentissage des langues étrangères. Différent des cartes classiques. Ces cartes sont plus efficaces, plus complexes, plus intéressantes. Ces cartes utilisent des tâches logiques avec des langues étrangères. Il faut 2-3 minutes pour résoudre un tel problème logique. C'est compliqué, mais intéressant. Les mots étrangers et les phrases sont mémorisés de manière très fiable. Here you can download PDF files with special cards for learning foreign languages - flushkards. These are not the cards that you have seen on other sites. These are special cards for effective training. When you use these cards, you think. And you are interested in it. These cards are made for your advantage. Use this opportunity. A new series of French cards with a different teaching methodology - in the near future. Simple cards waiting for memorization of foreign words are found in parts. You can find many sites where you can download them. they all have low learning efficiency. You have to use them many times to memorize words or phrases. Cards OFLAMERON change the teaching method, make it more effective. You can memorize foreign words faster. And the learning process will be more interesting. Simple logical tasks can greatly help in learning foreign languages. These cards use one of the methods OFLAMERON to memorize foreign words. A foreign word is written on the card. This word is missing letters (replaced by a question mark). You must write the letters and correctly make up a foreign word. There are 4-5 cards for each word. 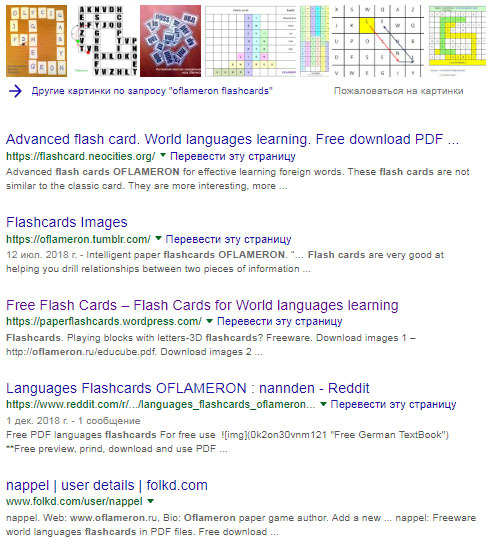 On the Internet you can find many special cards OFLAMERON for learning foreign languages, download a lot of files, manuals, games. All materials OFLAMERON for foreign languages ​​- can be downloaded for free.